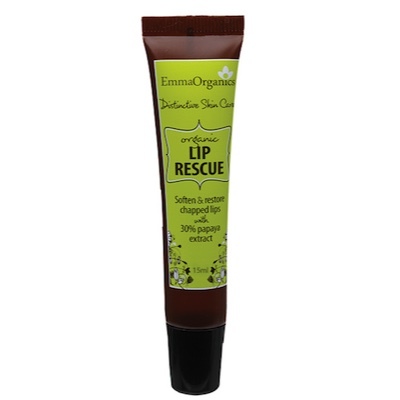 Emma Organics LIP RESCUE with active Papaya is a smoothing and protecting creamy balm designed to soften and restore chapped lips. Organic Papaya - a fruit extract for a restoring accomplishment to the skin surface. INGREDIENTS: Purified Water (Aqua), Organic Papaya (Carica papaya) Extract, Cetearyl Olivate, Sorbitan Olivate, Organic Aloe Vera (Aloe Barbadensis) Juice, Organic Macadamia (Macadamia ternifolia) Oil, Organic Shea (Butyrospermum parkii) Butter, Organic Coconut (Cocos Nucifera) Oil, Organic Avocado (Pesea gratissima) Oil, Glyceryl Caprylate, Organic Glycerine, Organic Bees Wax (Cera alba), Organic Cocoa (Theodrama cacao) Butter, Organic Blueberry (Vaccinium angustifolim) Flavour, Parfum (Natural Preservative), Xanthan Gum, Organic Coconut (Cocos nucifera) Water, Tomato Seed (Solanum Lycopersicum) Oil, Organic Cranberry (Vaccinium macrocarpon) Extract, Organic Rosemary (Rosmarinus Officinalis) Extract, Organic Olive Leaf (Olea europaea) Extract, Natural Vitamin E (Tocopherol).